Gen Con Day 3 – The First Day of Gen Con – Whose Turn Is It Anyway? HOLY COW IT’S THE FIRST DAY OF GEN CON!! Now that we have that out of the way, it’s the first day of Gen Con. Today will have an insane start. Up early for press badges. Early access to the Exhibit Hall. Standing in lines for games. Demoing Istanbul. Playing a giant board game. Watching some nerds put on a strip show. Just another day at Gen Con I suppose. 5:00 am – Wake up. Go to the Press Badge line. Wait. 7:30 am – Be one of the first 100 to get a Press Badge, so I can gain early access to the Exhibit Hall. 8:00 am – Desperately seek out some sort of caffeine. Enjoy it if at all possible. 9:00 am – Get in the Exhibit Hall an hour before the masses (suckers!). Film slo-mo running hug moment with Tiffany if we didn’t connect last night. Wander around. Film other stuff. Talk to folks. Get in Stronghold line for Panamax. 10:00 am – Be first in Stronghold line for Panamax. Throat punch anyone who is in front of me. Buy Panamax (x2). Go to Days of Wonder booth. Stand in line for Five Tribes. Buy Five Tribes. 11:00 am – Teach Istanbul to a fine group of people. 1:00 pm – Find something as cheap and not greasy as possible to shove in my face. 2:00 pm – Teach Istanbul to another fine group of people. 5:00 pm – Play Giant King of Tokyo against Tiffany, Steve, and Hunter. Make all of them cry. 6:00 pm – Teach Istanbul to a third group of fine people. 8:00 pm – Go say Hi to the Cardboard Republic people. 10:00 pm – Attend Nerdlesque Burlesque. 11:30 pm – Wipe excess glitter off of my person and see what else is going on. If fun stuff, do that. If not, sleep. 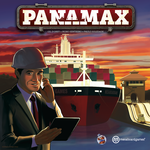 Panamax is a 2-4 player game designed by Gil d’Orey, Nuno Bizarro Sentieiro, and Paulo Soledade. Inspired by Panama Canal shipping lines, each player manages a shipping company and tries to move products through the canal. A turn consists of removing a die from the Action table, which allows them to select Contracts and Load Cargo or Move ships until the pool of dice is exhausted. Each round is designed to mimic the logistics needed to ship cargo, minimize transportation fees, and increase the net worth of the company. Whoever creates the most efficient and thereby profitable logistics network wins the game.